Who hosted holiness, quiet and unseen. What a lovely description of mary’s mantle, if only we could be such carriers of His grace. Thank you for this hope-filled encouragement, Joy. I’m in another exacerbation, and I’m not feeling so well. The doc put me on Prednisone, starting with a higher dose this time. I get so discouraged and am fighting God’s plan, but His whispers tell me that if I long to give my heart more fully to Him, I also have to trust His process. 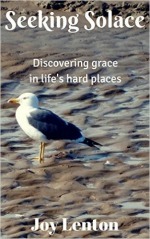 I’m trying to grasp the truth that His mantle of grace still covers me. Thank you! I pray God gives you rest in every way. May the love and joy of Jesus being born for us fill your heart and soul! Dear Bettie, I know you fully understand the way a life can get shifted by unforseen and unwanted circumstances that appear to limit us and shrink our world. And they do, often greatly. Yet as we learn to live a life we hadn’t planned to and adapt to changes in our health and home, we begin to open up to God in new and often desperate ways. You are a great blessing. Thanks for sharing this wonderful poem. It is rare to see such a post discussing the great role played by Mary. You are most welcome dear friend. Be blessed. I love the idea that God anoints and asks us to fulfill his calling, and I’m not surprised that he has called you to do the kind of work you are doing here. When you speak of the vast vistas before you even while limited in mobility, I’m reminded of Emily Dickinsons’ life–her reach was so vast and she blessed so many from the sanctuary of her home, rarely venturing out, yet the whole universe shone through her verses. A wonderful and blessed new year to you. I’ll look forward to your return.